When we started MBU 19 years ago - less than 100 Scouts attended our first event. Today, nearly 3,000 Scouts from several States attend this single-day event - making our MBU one of the largest in the Nation! Whether this is your first visit to MBU or you are a veteran - please read the instructions carefully - as some of our registration procedures have changed. Ready to get started? First, review the Class Schedule and read through the Event Class Catalog. These documents contain class times, descriptions, requirements and special instructions from our Instructors. Next, click the Registration button. Follow the instructions carefully, enter your classes and make your payment. That's it! The fine print. Registration and payment are online ONLY. Registration fee includes a hot lunch. Mail-in payments will not be accepted. Payments may not be made at the Scout Shops. We have added electronic check processing this year. Please follow all payment instructions carefully. Registration fees are NOT REFUNDABLE under any circumstances. There will be no onsite/day-of registrations. Payment must be received prior to the date of the event. A registration without payment does not constitute enrollment in a class. You will receive a registration confirmation email as well as a receipt-for-payment email. If you have questions pertaining to registration or payment, please review our Frequently Asked Questions document first, pose your question on our Facebook page or email us at PTDMBU@gmail.com. Please allow 24 hours for one of our volunteers to respond. MBU is a uniformed event. Scouts, Venturers, Adult Leaders and Instructors are required to be in uniform throughout the day. Want to stay connected and get the latest News on MBU? Visit our Facebook page. Need to talk to a human? Email us at ptdmbu@gmail.com. We're always looking for Merit Badge Counselors! Email us at ptdmbu@gmail.com to join the MBU Team. Are you looking for the TFC Training Expo? Adults can take classes too! Ready to get started? Please use the Registration button at the top of this page. 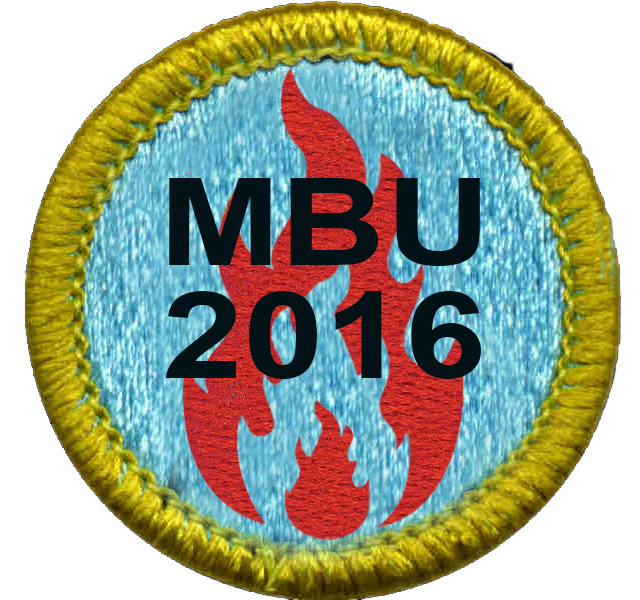 See you at MBU '16!